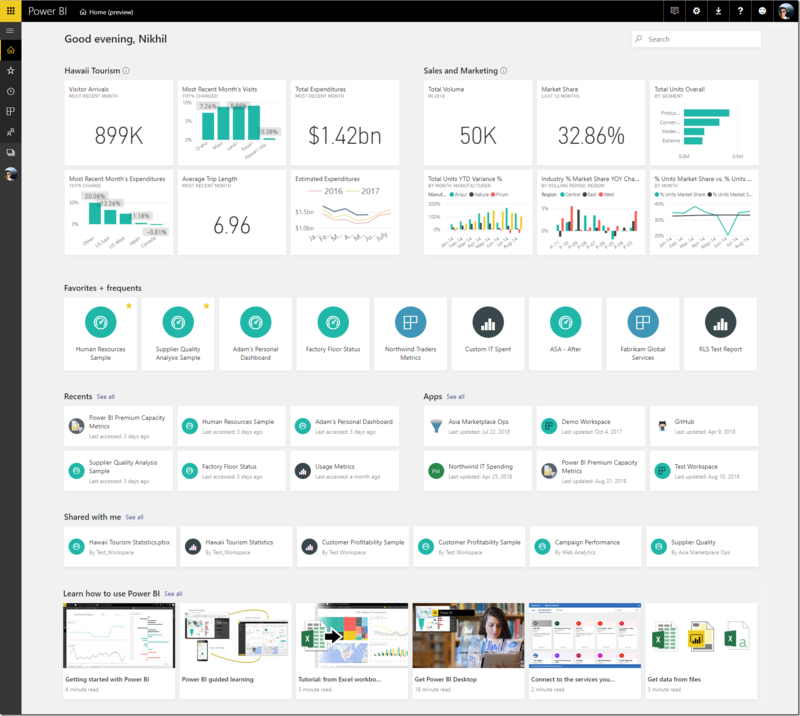 The Power BI service has transformed the way businesses leverage data to solve problems, share insights, and make informed decisions. Our users often track multiple dashboards and reports to stay on top of all their data. But as organizations grow, we’ve heard that it can become increasingly difficult for our end users to discover and manage the Power BI content that matters to them. We’re improving your overall navigation experience by making it easy to monitor and analyze your key business metrics. Whether you’re distributing insights or consuming them, we want you to be able to find exactly what you need when you come to the service. Today, I’m excited to announce the public preview of the Power BI Home landing page and our new Global Search feature in the Power BI service. Home will be your one-stop shop for all your content and a quicker way to dive into your insights. Gone are the days of digging through the long content lists in the left navigation to find that dashboard you want to see daily; Home will automatically surface your most important content or let you search for it in a single page! Note: The public preview is starting to roll out this week. It should be enabled for all users by September 28, 2018. Excited? 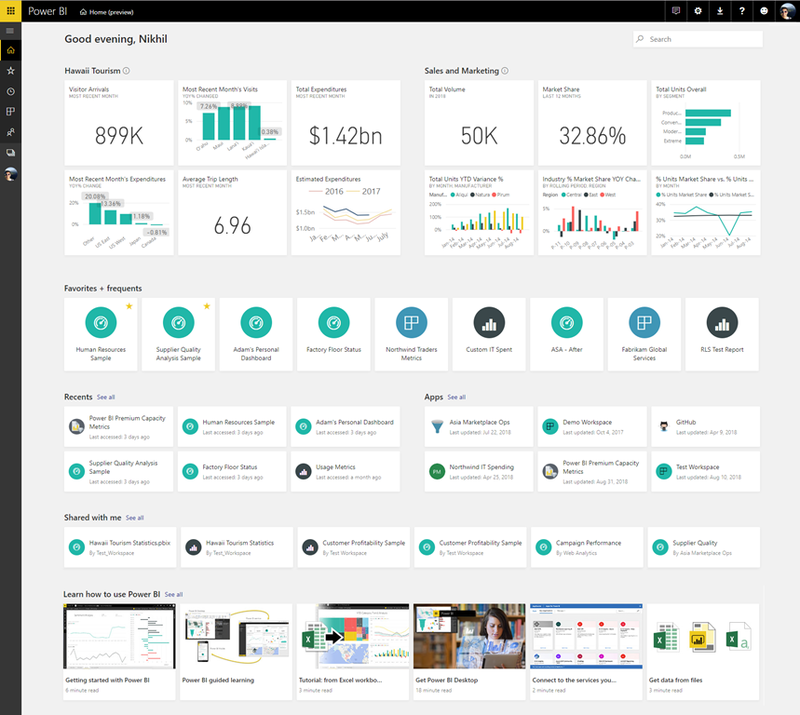 Read on for a tour of the new Power BI Home. 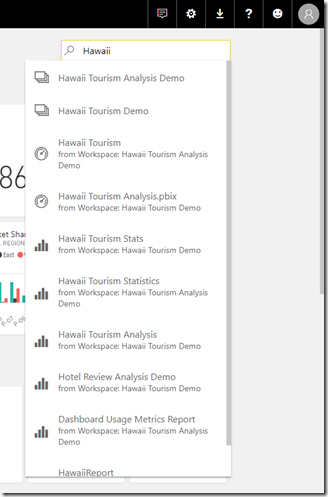 Or, head on over to app.powerbi.com to explore it yourself. Don’t see a pinned tiles section? Want one for yourself? Well, that’s easy! For this preview, all you need to do is favorite a dashboard that you want pinned and Power BI will automatically select and pin up to six tiles from that dashboard to Home. Note: We currently only allow you to pin tiles from two favorited dashboards. If you have more than two that are favorited, we automatically pick the ones that you most frequently use. Custom visuals and live report pages are not supported for this preview. We are evaluating this feature with a couple of other designs, so if you have feedback or want to see more, do let us know in the comments. As mentioned earlier, Home is focused on improving your overall navigation experience and surfacing your most important content. Right below the pinned tiles section, under Favorites + Frequents, you will be able to access all your favorited and/or most frequently used dashboards, reports, and apps. Right below that, all other content that you’ve accessed recently, apps that you’ve installed, and anything that was shared with you is surfaced in a single pane under Recents, Apps, and Shared with me. You no longer need to hunt through your browser bookmarks to find that dashboard or report that you view every single day – all of this will be available to you when you land directly in the Power BI service, one click away! Lastly, at the bottom, we added special section for learning resources. If you are a new user to Power BI and want to kickstart your journey, Home surfaces some top articles that will help you ramp up on both Desktop and Service. In case you missed it, on the top right of Home, there is a search field. This new features allows you to search for all the content that you have access to within your organization including dashboards, reports, apps, and workspaces. All you must do is type in a keyword and the overlay drop-down should list all the artifacts that match that term. In the results, you can identify the type of artifact based on the icon and if it is a dashboard or report, you can also see it’s containing folder. Note: For this preview, we only index every 24 to 72 hours, so any new artifacts that you create might not show up till the next day. 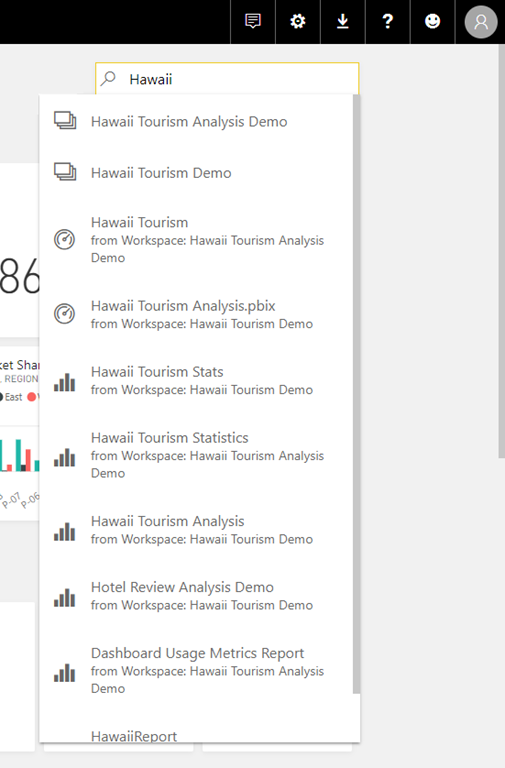 This public preview is our first step in making Power BI Home a personalized landing experience that serves your purpose. More features and capabilities are on the way, stay tuned! Cases of results not populating for Global Search the first time – Fix already on the way (ETA: End of week).